With a number of teams already having booked their place in the knock-out round, this looks like being a decisive day in the Olympic Qualification tournaments. 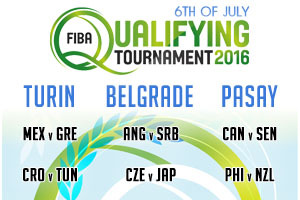 The group stages in Belgrade and Turin draw to an end today while the Manila tournament plays out today and tomorrow. In the opening game of Group A, Canada took the spoils, defeating Turkey by a score of 69-77 and the Canadians now look a very good bet to progress to the next stage of the tournament. In Group B, the hosts were downed 93-84 by France in a high scoring game that delighted the crowd. The Canadians are big favourites for this game and they know that a win here will surely see them top of the group. They may have played yesterday but you can expect to see Canada come out all guns blazing but whether they have enough to destroy Senegal remains to be seen. Take Senegal at +20, at odds of 1.83, and look to go UNDER 154.5 at odds of 1.83. Bet Now! This is the game the hosts have to win, and they should have enough about them to do so. The Philippines pushed France all the way and taking them at -6.5, at odds of 1.83, makes sense against New Zealand. If you are looking for the Over/Under market, look to go UNDER 159.5 which you can find at odds of 1.83. Bet Now! Puerto Rico have booked their place in the knock-out round, amassing 3 points in their two games. They defeated Angola by a score of 91-81 and this means that Angola are unable to catch them in the group. Angola take on Serbia in the last Group A game in Belgrade. Latvia have also booked their passage to the knock-out round, sitting with four points in their two games. The 71-59 win over Czech Republic sees them sitting pretty at the top of the table while Czech Republic and Japan go into a winner takes all match in Group B in Belgrade. Serbia are being tipped to absolutely maul Angola and the Serbs will be keen to take top spot in the group, so there may be no let-up in their play. Taking Serbia at -26.5, at odds of 1.83, is a bit of a risk but there is every chance they could rack up this score. For the Over/Under market, look to go UNDER 158.5, which you can find at odds of 1.83. Bet Now! Latvia mauled Japan and there is no reason why the Czech Republic cannot do the same thing in this clash. Take the Czech Republic at -23, at odds of 1.83, and for the Over/Under market, be sure to go UNDER 148.5 which is on offer at 1.83. Bet Now! Group A is already decided with Greece and Mexico in the next round but both of these teams will be desperate for a win which will allow them to take top spot in the group and perhaps an easier tie in the next round. Mexico defeated Iran by a score of 75-70 and although all three teams are currently on two points, with no more games left to play, Iran are eliminated. The hosts have qualified to the knock-out round with 4 points from two games after they defeated Croatia by 67-60 in their Group B match. This means that there is a final spot up for grabs when Croatia face Tunisia on Wednesday evening. Mexico may be through but there should be a gulf in class between the two teams that sees Greece win the game. It may be that the Greeks do enough to be comfortable though without going all out for a crushing victory. With this in mind, look to back Mexico at +19.5, which is on offer at odds of 1.83. For the Over/Under market, look to go OVER 145.0 which you can find at odds of 1.83. Bet Now! Croatia are likely to bounce back in this game and they’ll be looking to clock up as many points as possible. Look for Croatia at -22.5, on offer at odds of 1.83, and for the Over/Under market, opt to go OVER 145.5 which you can find available at odds of 1.83. Bet Now!